For as long as I’ve volunteered at Free I.T. Athens, all computers in the store came with GNU/Linux, 4GB of memory, and at least 160GB of storage space. I’m sorry to say that as of last week Free I.T. Athens’ new minimum for desktop storage is 80GB. Why did we make this change? It’s all thanks to the great hard drive shortage of 2018. For the past few months we’ve struggled to keep up with the store and grant requests because so many desktops are being donated without hard drives! We hobbled along for awhile by using larger drives in the desktops (2TB of storage, anyone? ), but to break even we had to up the price of those machines. $55 for a dual core desktop, however, just felt wrong. As my fellow staff members and I struggled to figure out what to do, a wave of 80GB hard drives came in thanks to the kind donations of community members and local businesses. It seems every hard drive donated these days is 80GB. The smaller drives piled up and so did the desktops on the to-be-refurbished shelf because we eventually ran out of even the super large disks. Last week, it became clear that we needed to drop the minimum storage size. So many great computers with no hard drives! That’s not to say that all the computers in the store or that go out through our community grant program will have only 80GB. Many will have more. We don’t think this will matter to most people now that so much of our files have moved to online services. 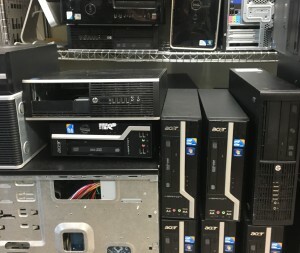 That being said, if you come the into shop for a desktop, we’ll do our best to point out computers with smaller storage and make sure that the one you choose meets all your needs. As always, we appreciate your continued support! If you have any questions, drop us an email at contact@freeitathens.org. P.S. Next time you donate a computer, please consider donating the hard drive as well. All of us take personal data very seriously and we securely wipe all donated drives (if we can’t for whatever reason, volunteers smash them with a hammer!). To learn more about that processes, check out the “Your Personal Data is Safe” section on the Donations page.